The 16-year-old that Troopers arrested and charged Monday with setting a fire at a Delta Junction house on Sunday also is charged with torching the Clearwater Lodge, shown here on the morning of May 15th. 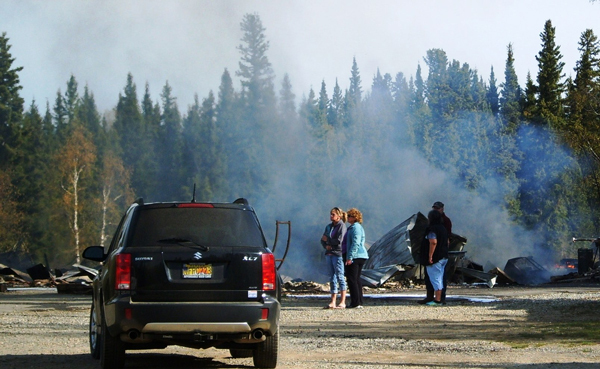 Alaska State Troopers have arrested a 16-year-old male and charged him with arson for setting a house in Delta Junction on fire last weekend and for the May 15th fire that destroyed the Clearwater Lodge. Troopers investigating the May 15th fire that destroyed the Clearwater Lodge got a big break in the case Monday when they were questioning the juvenile about another fire on Sunday that heavily damaged a Delta-area home. Troopers says they found evidence that showed the house had been broken-into and that items were stolen before it was set on fire. According to a Trooper report issued this morning, investigators were able to identify the suspect and the vehicle he allegedly was using. The report says the 16-year-old admitted to the theft and arson. During the investigation, Troopers also learned the juvenile was responsible for the Clearwater Lodge fire. The report is unclear as to how, but the implication is that he admitted to that crime as well. The juvenile’s identity hasn’t been released. Troopers don’t identify juveniles involved in criminal cases. Monday’s arrest was good news to Kevin Ewing, who along with his wife, Patsy, own the Lodge. Ewing says he hopes that others who he suspects also were involved also will be rounded up. “We’re very happy that this group (is) off the street and not doing this kind of stuff anymore,” he said. Ewing estimates the arsonists that destroyed his lodge will cost him about a million dollars. He says his insurance policy didn’t cover the half-million-dollar appraised value of the structure. And the Ewings plan to build a new lodge on the site of the old one on the banks of the Clearwater River east of Delta. The juvenile charged with arson was taken to Fairbanks Youth Facility Monday on multiple charges of arson, theft, and other offenses in connection with the two fires. Investigators can’t yet say whether others were involved in one or both fires. An investigation in both cases continues.